Stuart Gardiner's cotton towel takes you on a potent tour through whiskey history and lore. Next time you order or mix up an Old Fashioned, consider this: Your favorite cocktail has an incredible history. Info graphic wizard Stuart Gardiner has a well of whiskey knowledge. His highly detailed, vibrant cotton towel takes you on a potent tour of the spirit including how it's made in different countries (hint: it's different! ), common ingredients, and barreling practices. 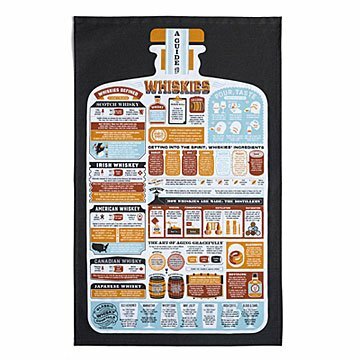 Finish off your journey through whiskey-dom by making one of the seven classic cocktails printed along the bottom of the towel. Made in the UK. Have a bartender son who this is perfect for. Threw it into a frame & it looks great! Recipient seemed to like it! Went perfectly with their bar. Interesting info on towel. Tea towel is perfect decor! I meant for them to use the Whiskey Lovers Tea Towel as a towel, but he won't let them be used - they are part of the decor! I love this tea towel!